When the javadoc tools build the documentation, it copies all files included in the doc-files directory to the javadoc . (see How to Write Doc Comments for the Javadoc Tool). If you run PlantUML before the Javadoc, it will generate image1.png in the directory doc-files . Note that the definition of the image itself is in a non-javadoc comment, so that it is not exported to HTML. 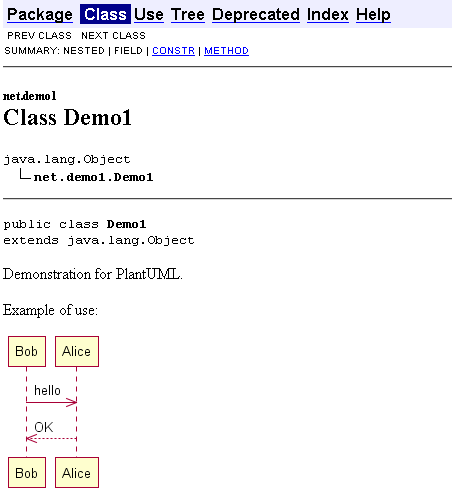 As you can see, adding UML diagrams into java documentation is now really easy.